I've been doing my 6-9 boss pet route (pictured above) on 3 characters for almost a week now, and I think I've got the run down pat. I'm aware that howl-bomb pretty much finishes all of the NPCs off easily, but it's such an uninspired and boring strat to me. Instead, I've gone with my own teams. I took ideas from @SerrinneWoW's Wowhead guide, then mixed and matched those with my own ideas. I wish I could say that the Wowhead comments on the boss pet pages also helped, but unfortunately those comments are largely filled with "howl-bomb works for all lawl"-type of remarks. Anyway, the teams that I use work roughly 90% of the time. With bad RNG, I sometimes have to restart the fight. Secondary pets such as snakes and crabs can be my downfall (but not always), especially if they're P/P breed. Ouchies. Still, I'm satisfied with how it's been working out for me, which is well enough for my liking. You could probably replace some of the pets that I use with other, similar ones. The Emerald Whelpling did well in place of the Emerald Proto-Whelp, for example. As for the breeds, those are just the ones that I have. I'm sure other breeds could work (maybe even better than the ones I chose), but I haven't bothered to test them. And yes, MVP of Tanaan pet battles is the Emerald Proto-Whelp. This little guy does some serious work! With the addition of the Magic Pet Mirror in the upcoming 6.2 patch, the Look-a-Like Challenge series is done for. The new toy will allow you to look like any of your (combat) pets, making the search and need for NPCs that look like pets unnecessary. I'm excited for the Pet Mirror in 6.2, but at the same time I'm a little sad to see this project come to an end. It was a fun challenge and I thoroughly enjoyed the hunt for NPCs to turn into. Some of them required a lot of brainstorming and testing. Thank you to everyone that provided helpful information on different pet look-a-likes, and thank you to my OH for assisting with the tougher costumes. Wowhead has some new guides that will interest collectors in 6.2. Order of the Awakened and The Saberstalkers. Both factions have pets for sale but only to those with the right reputation. For the Order of the Awakened, it seems as though there's only one main way to earn rep - complete the daily quest Unseen Influence for 1500 reputation. You won't want to miss a day since you need Exalted with the faction before you can buy the Blazing Firehawk. At the rate of 1500 per day, it'll take a total of 28 days of dailies. If you're lucky enough to come across a Medallion of the Legion it will cut down your grind time by roughly one day per medallion. The Saberstalkers might be an easier rep grind, if you don't mind killing (elite) mobs over and over that is. You need to defeat blackfang NPCs in Fang'rila for their claws (the currency to buy Savage Cub) anyway though. Only Revered is necessary and you'll need 1500 claws. 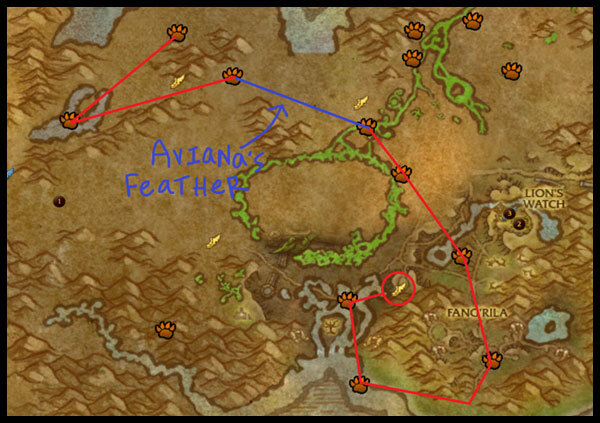 It's tough to estimate how long it will take to reach Revered since there's a few different mobs that you can kill. The majority will reward 30 rep each, while the Fang'rila rare elites give 600 a kill. On top of that there's a weekly quest that rewards 3500 rep. If you complete just the weekly, it'll take you 6 weeks to reach Revered. But it's almost certain that the grind time will be less since you have to kill the NPCs for claws and will earn reputation alongside that. And of course, the Medallion of Legion mentioned above can be used for this faction too. Keep in mind that all of these values are before any reputation bonuses, such as the buff from the level 3 Trading Post. I don't know if Order and Saberstalker reputation is affected by rep modifiers, but I'm hoping so! Update: This little guy is just full of surprises! After a day of waiting (and some worrying), I finally received Graves! Wheee! I logged into Heroes early this morning and was prompted with a notification that I had earned Graves (and the Hearthstone card back), so of course I had to log immediately into WoW and collect my little golem. Graves has some interesting animations. He idles about and also occasionally sits down. If you emote /dance at him, he'll do a cute little dance on his tiptoes (pictured above). Additionally, he'll cast his signature telegraphed stun move and then stomp the ground (pictured below). If you've played Heroes before, you'll recognize this is the same move that Graves' larger counterpart does down in the mines on the Haunted Mines map. Overall, I'm pretty please with Graves. I haven't tried him in Pet Battles yet, but I hear he's decent. I don't know if he's an OP "must have" like a few other promotion pets though. Blizzard is slowly working on sending out this pet to everyone (those eligible should have it by the end of the week), so check your Heroes account every now and then for the achievement prompt. Good luck to everyone still working towards collecting Graves! Last week developer Jeremy Feasel (aka: @muffinus) responded to the concerns voiced about the upcoming Crimsonwing Moth and Sapphire Firefly spawns in 6.2. I tested it on the PTR, and at the time the moth did not have an instant respawn once one was captured. "They were intended to be instant-respawn, fixed. There will always be one up." It's great that these two wild pets have an altered spawning mechanic and they won't be exactly the same as the Unborn Val'kyr. Having at least one up at all times will make it a little less painful to hunt for. I'll be honest and say that I'm still not thrilled about the way the pets are being implemented, but at the same time I'm grateful for this change to the original Valk spawning. It's as good a compromise as we'll get. What will this mean for collectors, though? Once all of the pet spawns are discovered, there will be a lot of camping, sitting and waiting and server hopping. It will be a free-for-all, first come, first served. This in itself could be frustrating for some, especially those on a PVP server (yikes), but it's probably the lesser of two evils in this case. I'm debating whether or not I'll be the first ones out there hunting for these two pets. Or if I should wait a few weeks until after the initial excitement dies down. Normally I go with the former. Word of new pets doesn't spread as quickly as a flashy new mount, and I've found that participation in the search for pets mostly picks up rather than dies down after the first few weeks. Only after maybe months does the interest waver. Anyway, we'll see how I feel. Since these two pets are nothing spectacular and I'm not all that enamored by their spawning mechanic, I may just put it off until I've collected all the other 6.2 pets. Then again, the itch to collect them all straight away might be too much to bear. My obsession with pets might compel me to sit for hours on end waiting for these two pets, against my better judgement. Well, that's what developers are hoping for right? Silly collectors like me who will do almost anything for a pet heh.